I’m still working on part 2 of Knitting Self-Help Books, but in the meantime here’s a random recipe! As Mom says, I’m becoming a regular house wife – knitting, baking, cooking 😛 Except that I work. It’s a miracle that I manage to blog. 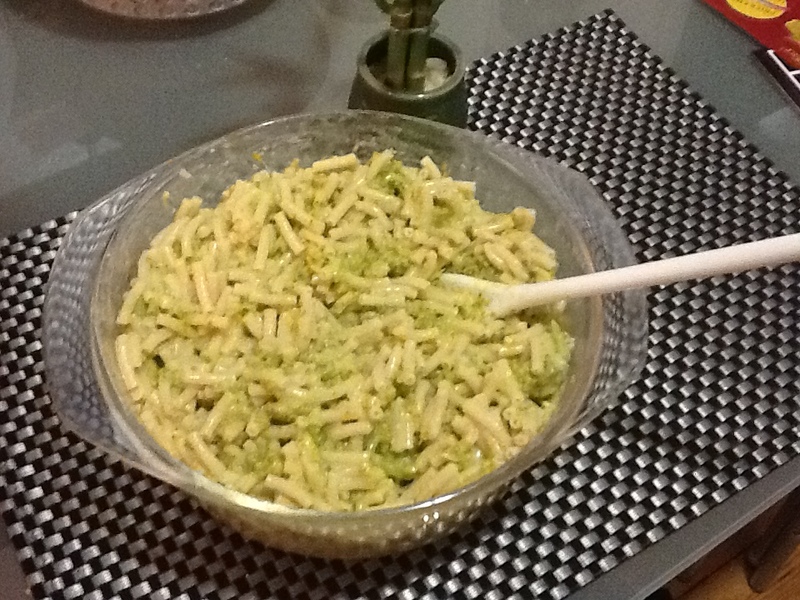 When I was little, there was only one way my mom could get my brother to eat broccoli: smother it in cheese and noodles. I loved it too – it was a favourite Sunday meal in our house. Seeking to make it on my own, I realized it is perhaps a bit heavy on the fat. Below is the rendition I developed that is a little lighter on the arteries, but equally as delicious. 2 cups grated cheddar cheese. 1) In a large pot bring enough water to cover broccoli to a boil. Add broccoli and let boil over medium-high heat until stems are easily punctured through with a fork, about 20 minutes. Drain. 2) Meanwhile, melt margarine over low heat. Slowly sift flour into margarine, stirring constantly. 3) Add milk slowly while whisking mixture. Continue to whisk frequently over medium heat until mixture starts to thicken, about 5 minutes. 4) Reduce mixture to low heat. Add cheeses, garlic, onion powder, salt, pepper and stir until cheese is well dissolved. 6) Combine with noodles in a large dish. Stir well. Serve hot! This entry was tagged recipes, vegetarian. Bookmark the permalink.